As educators, I believe acknowledging what others think is a vital part of the self-reflective journey to always improve and get better. I think it’s also important to note that what others think should not be the driving force behind what we say and do; it’s merely a piece of the whole puzzle. Wouldn’t it be nice to leave a positive legacy that will not only be remembered, but will serve as an inspiration and motivation for others for years to come? What will your legacy be? For what will you be remembered? Will your legacy be a legacy of treating others respectfully, fairly and individually? Will your legacy be a legacy of trust and tolerance to the needs of others? Will your legacy be a legacy of shared, collective and collaborative approaches toward improvement? Will your legacy be a legacy of sincerity, selflessness and reliability? Will your legacy be a legacy of humility and acceptance of failure as a means toward growth? Will your legacy be a legacy of flexibility, enthusiasm and energy? Will your legacy be a legacy of courage, strength and vision toward shared aspirations? Will your legacy be a legacy of helping and serving others so they can achieve their goals? What kind of legacy are you leaving…? This was found via Twitter…can’t remember the resource. Student thinking lies at the heart of our teaching. We must plan with students in mind (not just content). Our plans must be explicit to WHOM we are teaching. We must think about whether or not our students need more background knowledge, small or whole group lessons, and how much time needed to build/connect/understand concepts. Their thinking is the essential resource. It powers all the work in our classroom. Differentiation is/becomes NATURAL if you are aware and know your students’ needs. It is not about what is NEXT – it is about what is in front of you. How often do we really sit down and ask ourselves/consider how and why students struggle? It is important to value these moments when students don’t know the answers. Deeper not wider – What good is teaching every detail of unit of study if students don’t understand it. Keep the body of the lesson focused on open-ended topics. Probe students’ thinking and listen to them. Students should be doing most of the talking in the classroom. Talking allows a teacher to discover what his/her students know and where they are struggling. It gives students a chance to express different ideas and interpretations. It serves as a window into students’ thinking processes. It gives students a chance to connect with one another and it supports the growth of more ideas. Create a space for students to reflect after the lesson on their academic work and social interactions. Classrooms should be full of VISIBLE THINKING from students. Build a sense of community – Teaching students the skills they need to interact with one another allows us to facilitate lessons in much more meaningful ways. Purpose/Powerful Lessons – Lessons should be engaged in meaningful thinking and interaction. Purpose involves rigorous thinking, creativity, and risk-taking. Use the “TEACHABLE MOMENTS.” Powerful teaching is the result of intentional planning and deep reflection. Monitor student thinking – data is intentional (journals, writing, conversations, brainstorming, tweets, edmodo, reading, sharing mental images, and formative/summative assessments). Allow for reflection, both academic and social debriefing. Asking questions (after you listen) – What are you thinking about? What are you wondering about? Foster investigation, inquiry, wonder, and imagination. Risk-Taking is essential for growth. It thrives in a safe and supportive classroom community where students feel known and accepted. Classrooms should be designed so that collaboration, imagination, and community are at the center of classroom life. Students need to feel free to try something on their own. You have to be self-seeking…Always searching for better ways…Always wanting better for your students…searching for growth…taking advantage of PD/learning opportunities…IT IS CONSTANT/LIFE-LONG LEARNING! The learning that a teacher gains will both directly and indirectly affect student learning. I have played with Legos all my life. I can remember when I was 7…my mom and I playing with Lincoln Logs and the glow-in-the-dark Legos. I eventually moved on to Lego Robotics and Knex. I have passed this love off to my three boys and integrated them into my classrooms (as a teacher). Sign #1: You wish you had an impact beyond your classroom. If you find yourself yearning to take an idea beyond your classroom, you’re probably ready to become a leader. The first step might be as small as sharing a lesson plan with a colleague down the hall. Then you might spread your expertise further. Perhaps you will blog about how your students are using iPads to work on letter recognition, submit an article to your favorite professional journal, or share your knowledge in topic-focused Twitter chats. Or maybe your next step will be to help “unpack Common Core standards” for your department, or to offer to lead a workshop on bullying. Whatever path you take, don’t wait to be invited. Act on your interests—you’ll be glad you did. Sign #2: Colleagues often ask you for advice. Are you a go-to teacher? You aren’t sure quite why, but your colleagues are beginning to turn to you (yes, YOU!) for advice on how to handle difficult situations. Guess what? You probably have what it takes to lead. See Sign #1 for some ways to proceed. It’s great that your colleagues come to you for advice, but are there ways to share your expertise with even more educators? Sign #3: You “think big” about problems. When others are complaining, you’re imagining solutions. You can see ways that the system can change to help you and your colleagues to better serve students—whether at the school, district, state, or national level. Maybe your next step is to have frank, open conversations with your principal about solving problems at your school. Maybe you will serve on a district leadership committee, acting as a spokesperson for your grade level at a school board meeting. Or perhaps you’ll become involved with teacher advocacy through your union. Whatever the case, other teachers are beginning to look to you as someone who can help them move beyond frustration to positive action. You have the potential to extend the impact of your leadership by getting involved in district, state, and even national initiatives to improve teaching and learning. Sign #4: You want to take new teachers under your wing. You watch new teachers at your school and think, “Wow, I’ve been there and wished someone would help me out.” You have a keen sense of what kind of preparation teachers need to be successful in the classroom. You’ve probably offered advice and informal support to at least one new teacher. Your next step might be to volunteer as a cooperating teacher for a preservice college student, or an official mentor to a new teacher in your building. Maybe you will agree to serve on a “walk-through” team, observing teachers and offering helpful feedback. You might even become an instructional coach or take on a hybrid role in which you are adjunct faculty at a local teacher- preparation program. Whatever the case, you care about the future of the profession. When you begin to invest time and energy in new teachers or preservice teachers, it’s a sure sign that you’re becoming a leader. Sign #5: You always want to know more! You are afflicted with lifelong learning. What you know about the profession isn’t enough—you are eager to dig deeper into pedagogical strategies and/or your content area. You read. A lot. Perhaps you’ve already taken one next step: enrolling in a master’s program. Or maybe you’ve already developed a Personal Learning Network of teachers across the country who regularly exchange ideas and help each other improve. And you might also be pursuing the rewarding but challenging experience of seeking National Board Certification. So many avenues for learning! When you find yourself writing, advising, listening, collaborating, networking, seeking knowledge, reflecting, be aware. These are traits of leadership. Know, too, that there is no one “correct” path to becoming a teacher leader. I encourage you to check out the Teacher Leader Model Standards, which highlight a range of ways for teacher leaders to improve schools. The right next step for you will depend on your own strengths, ambitions, and circumstances. But I can promise you this: When you go beyond what is expected, when you act on your desire to develop and learn, you won’t regret it. LORAX – Unless Someone Cares! I loved THE LORAX MOVIE! I am very aware of the meaning of the book; however, there is a lot of things one can take from the movie/story. Let’s start with the basics…the characters (symbolism) in the story. Grickle Grass – represents the thistled mess we will be left with if we do not care for what we have been given. Truffula Trees -represent agriculture. If we keep clearing the rain forest then we will loose animal populations that will have to travel elsewhere to get their needs met, many will become extinct. I love these COLORFUL trees. Onceler – represents big business that is too busy looking at the profit line to take heed to what damage their business is doing. The Barbaloots (bear-like creatures) – represent the lifeforms we are disrupting by polluting their environments and destroying their habitats. The barbaloots may even be ourselves. The Boy – is entrusted with the last Truffula seed and represents the hope of the future. When you make a commitment, you create hope. When you keep a commitment, you create truste. So what did I take from the MOVIE? Trees FALL the way they LEAN…Be careful which way YOU LEAN. This has a powerful meaning as far as leadership and accountability. Trees change with the seasons….CHANGE is good….it is a mindshift! “How BAD can it be”…to create trust? You did good BEAN POLE…when is the last time you did good or told someone they did a good job? PLANT the SEED and let it GROW! Interest-powered. Interests power the drive to acquire knowledge and expertise. Research shows that learners who are interested in what they are learning, achieve higher order learning outcomes. 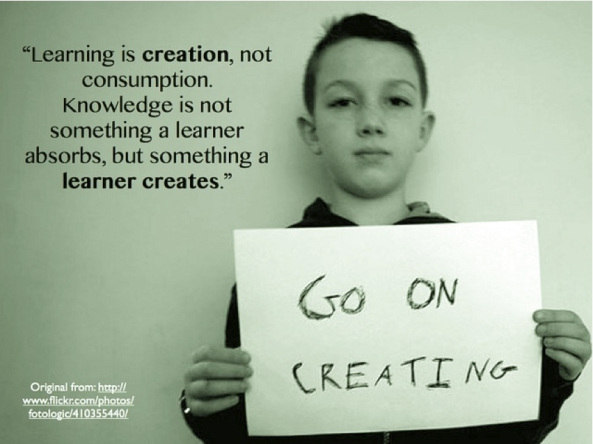 Connected learning does not just rely on the innate interests of the individual learner, but views interests and passions as something to be actively developed in the context of personalized learning pathways that allow for specialized and diverse identities and interests. Peer-supported. 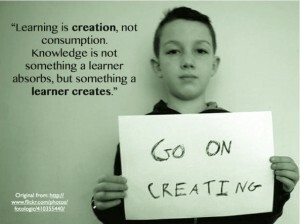 Learning in the context of peer interaction is engaging and participatory. Research shows that among friends and peers, young people fluidly contribute, share, and give feedback to one another, producing powerful learning. Connected learning research demonstrates that peer learning need not be peer-isolated. In the context of interest-driven activity, adult participation is welcomed by young people. Although expertise and roles in peer learning can differ based on age and experience, everyone gives feedback to one another and can contribute and share their knowledge and views. Academically oriented. Educational institutions are centered on the principle that intellectual growth thrives when learning is directed towards academic achievement and excellence. Connected learning recognizes the importance of academic success for intellectual growth and as an avenue towards economic and political opportunity. Peer culture and interest-driven activity needs to be connected to academic subjects, institutions, and credentials for diverse young people to realize these opportunities. Connected learning mines and translates popular peer culture and community-based knowledge for academic relevance. Shared purpose. 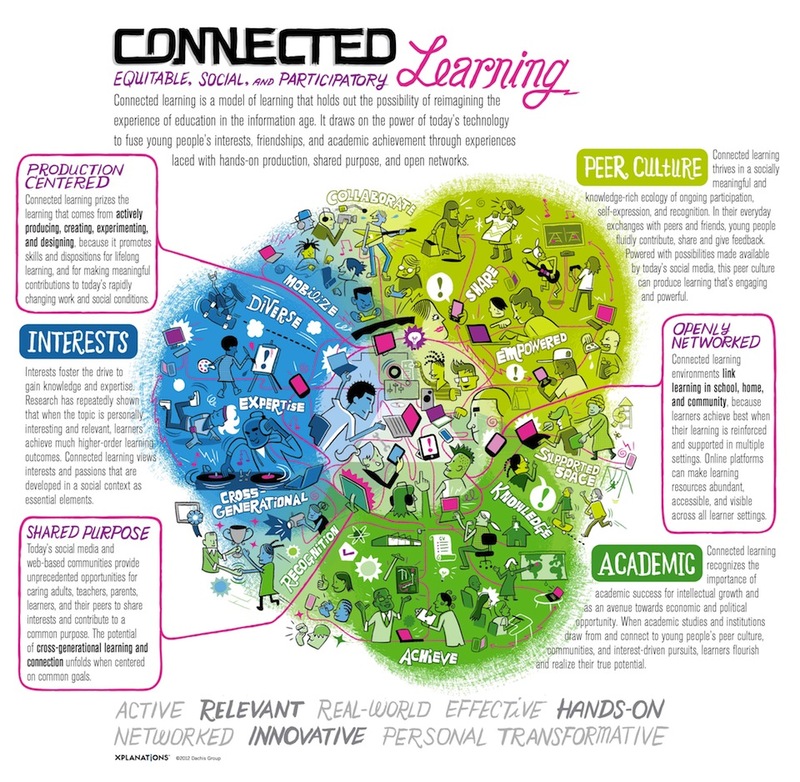 Connected learning environments are populated with adults and peers who share interests and are contributing to a common purpose. Today’s social media and web-based communities provide exceptional opportunities for learners, parents, caring adults, teachers, and peers in diverse and specialized areas of interest to engage in shared projects and inquiry. Cross-generational learning and connection thrives when centered on common interests and goals. Production-centered. Connected learning environments are designed around production, providing tools and opportunities for learners to produce, circulate, curate, and comment on media. Learning that comes from actively creating, making, producing, experimenting, remixing, decoding, and designing, fosters skills and dispositions for lifelong learning and productive contributions to today’s rapidly changing work and political conditions. Openly networked. Connected learning environments are designed around networks that link together institutions and groups across various sectors, including popular culture, educational institutions, home, and interest communities. Learning resources, tools, and materials are abundant, accessible and visible across these settings and available through open, networked platforms and public-interest policies that protect our collective rights to circulate and access knowledge and culture. Learning is most resilient when it is linked and reinforced across settings of home, school, peer culture and community. 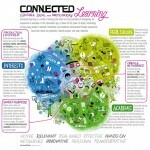 Below is an infographic made by Dachis Group that highlights these essential components of connected learning. 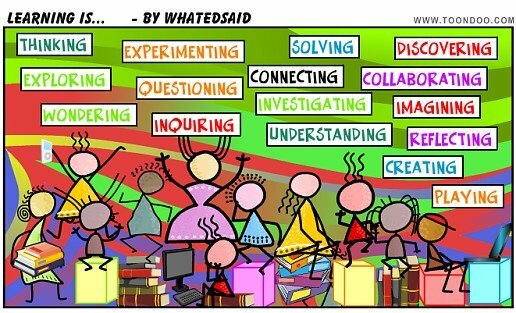 What if every learning environment was centered around these principles?